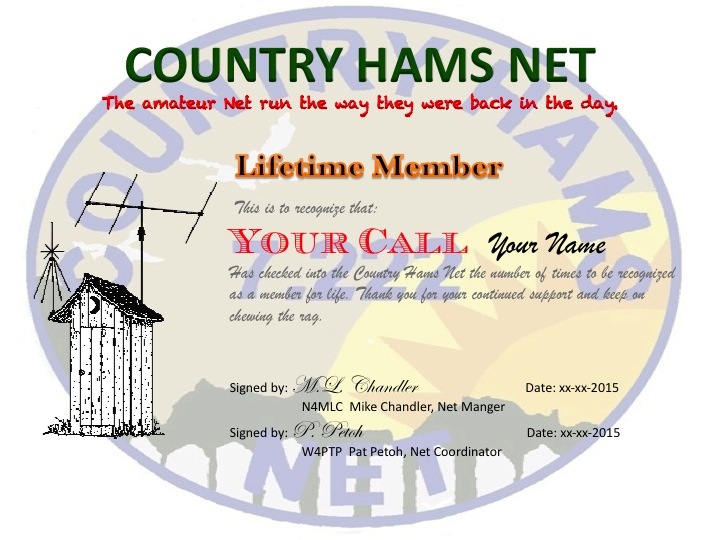 Country Hams is a net where you can talk about projects, chat with friends or just enjoy ham radio. Our goal is to provide a relaxed place where you can chew the rag and not feel pressed to cut it short. We have no dues, fees or numbers. We run a round table style net that is open to all. We encourage every Ham from brand new to old timers to check and join the chat. Discussion topics are up to the group. If you need a signal report on a new radio, new antenna, or test and setup a new microphone come on in we'll be glad to help. Here's the best part, take as long as is necessary we're in no hurry and glad to help. Country Hams Logger We've walked away from "NetLogger". Country Hams now has it's own logging program, "Country Hams Logger". K4ELO developed this logging software that he has shared with us. The logging program is also used on Nightwatch and the Brothers Nets. Thanks Wayne for including Country Hams! Being web based you can log into Country Hams from any where using a smart phone, pad or laptop. To use the Country Hams Logger program either click on the link below or in your web browser and type in: http://countryhamslogger.net When the program comes up go to "Net Login" type in your Callsign and Name. If the net is up the logger will display who's on the Net, who's the NCS, who is logging the Net and the IM is active, looking forward to see you on the net. If you like using our logging program please consider making a donation to help support the cost of running net logger. You can send a PayPal donation to K4ELO@fastmail.FM or mail a check to K4ELO - address is on QRZ.com. Any amount would be greatly appreciated. Country Hams Certificate Check into Country Hams 10 times or so and you become a regular. Then receive a printable electronic copy of our Country Hams Certification as a thank you for supporting the net. Below is a sample of the certification.